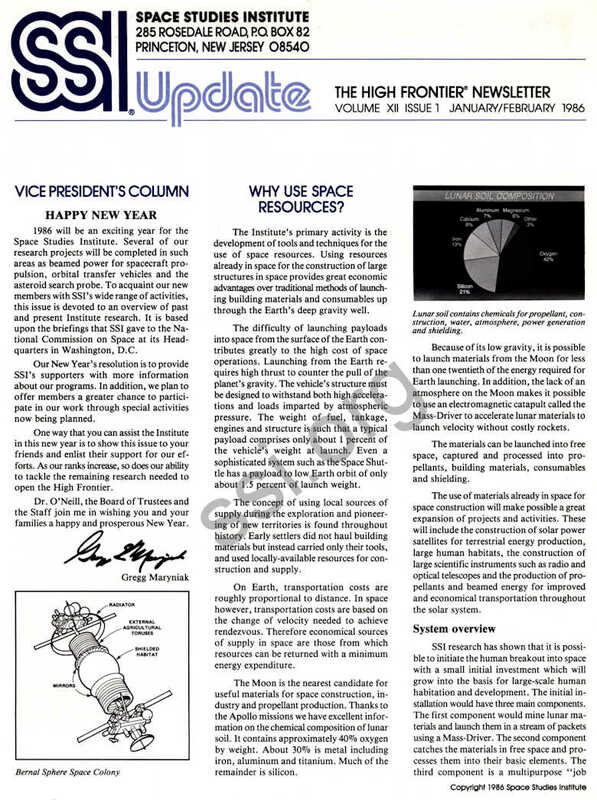 1986 will be an exciting year for the Space Studies Institute. Several of our research projects will be completed in such areas as beamed power for spacecraft propulsion, orbital transfer vehicles and the asteroid search probe. To acquaint our new members with SSI’s wide range of activities, this issue is devoted to an overview of past and present Institute research. It is based upon the briefings that SSI gave to the National Commission on Space at its Headquarters in Washington, D.C.
Our New Year’s resolution is to provide SSI’s supporters with more information about our programs. In addition, we plan to offer members a greater chance to participate in our work through special activities now being planned. One way that you can assist the Institute in this new year is to show this issue to your friends and enlist their support for our efforts. As our ranks increase, so does our ability to tackle the remaining research needed to open the High Frontier. Dr. O’Neill, the Board of Trustees and the Staff join me in wishing you and your families a happy and prosperous New Year. The Institute’s primary activity is the development of tools and techniques for the use of space resources. Using resources already in space for the construction of large structures in space provides great economic advantages over traditional methods of launching building materials and consumables up through the Earth’s deep gravity well. The difficulty of launching payloads into space from the surface of the Earth contributes greatly to the high cost of space operations. Launching from the Earth requires high thrust to counter the pull of the planet’s gravity. The vehicle’s structure must be designed to withstand both high accelerations and loads imparted by atmospheric pressure. The weight of fuel, tankage, engines and structure is such that a typical payload comprises only about 1 percent of the vehicle’s weight at launch. Even a sophisticated system such as the Space Shuttle has a payload to low Earth orbit of only about 1.5 percent of launch weight. The concept of using local sources of supply during the exploration and pioneering of new territories is found throughout history. Early settlers did not haul building materials but instead carried only their tools, and used locally-available resources for construction and supply. On Earth, transportation costs are roughly proportional to distance. In space however, transportation costs are based on the change of velocity needed to achieve rendezvous. Therefore economical sources of supply in space are those from which resources can be returned with a minimum energy expenditure. The Moon is the nearest candidate for useful materials for space construction, industry and propellant production. 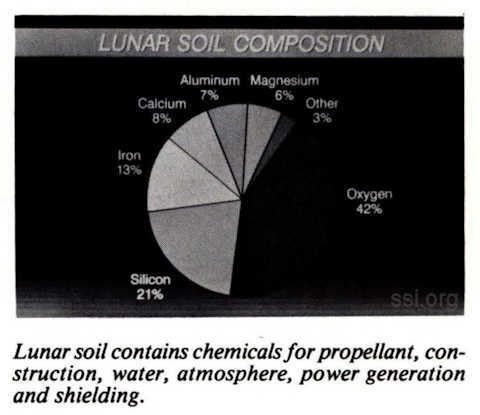 Thanks to the Apollo missions we have excellent information on the chemical composition of lunar soil. It contains approximately 40% oxygen by weight. About 30% is metal including iron, aluminum and titanium. Much of the remainder is silicon. Because of its low gravity, it is possible to launch materials from the Moon for less than one twentieth of the energy required for Earth launching. In addition, the lack of an atmosphere on the Moon makes it possible to use an electromagnetic catapult called the Mass-Driver to accelerate lunar materials to launch velocity without costly rockets. The materials can be launched into free space, captured and processed into propellants, building materials, consumables and shielding. The use of materials already in space for space construction will make possible a great expansion of projects and activities. These will include the construction of solar power satellites for terrestrial energy production, large human habitats, the construction of large scientific instruments such as radio and optical telescopes and the production of propellants and beamed energy for improved and economical transportation throughout the solar system. SSI research has shown that it is possible to initiate the human breakout into space with a small initial investment which will grow into the basis for large-scale human habitation and development. The initial installation would have three main components. The first component would mine lunar materials and launch them in a stream of packets using a Mass-Driver. The second component catches the materials in free space and processes them into their basic elements. The third component is a multipurpose “job shop” which fabricates most of the parts for additional Mass-Drivers, catcher-processors and job shops. The system, which operates with help from human operators connected by radio link from the Earth can double itself about once every 90 days. Once the system has “bootstrapped” itself to a desirable level, the output can then be used to supply components for solar power satellites, large antennas or space colonies. 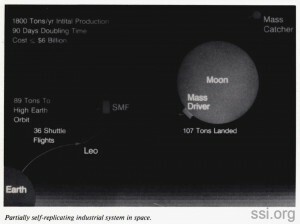 The initial cost of placing the start-up components in space and on the surface of the Moon is about the same as the cost of two large North Sea oil rigs. The purpose of a mass-driver is to accelerate payloads of mass to a high velocity, by the transformation of electrical energy to the mechanical energy of motion. In one application, the payloads would be of lunar soil, the mass-driver would be mounted on the lunar surface, and it would accelerate the payloads to the the escape velocity of the Moon. They would escape lunar gravity and be collected at a point in space to serve as raw material for space manufacturing. 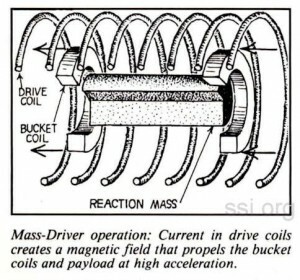 The active portion of the mass-driver consists of a moving payload holder or “bucket” and a series of drive coils which form a tube. The bucket has an energized coil called the bucket coil. The drive coils accelerate the bucket coil and payload down the length of the machine. When the payload has reached lunar escape velocity, a slight braking force is imposed on the bucket to release its payload. 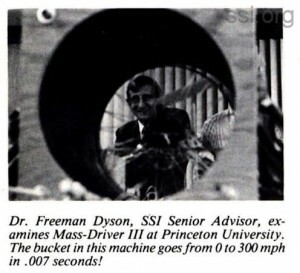 The bucket is then diverted into a reverse-action mass-driver which slows it, recovering most of the electrical energy that went into accelerating it. A new payload is inserted and the bucket re-launched down the track. Although the idea of using an electric catapult in space applications had been dis­cussed by both scientists and science fiction authors for some years, the first practical device was constructed by Dr. Gerard K. O’Neill and Dr. Henry Kolm in 1977 Prior to this device it was generally believed that the practical limit to the capability of this sort of device was 50 gravities of acceleration. Drs. O’Neill and Kolm, working with their graduate students at MIT, constructed Mass-Driver I from about $3,000 worth of scrounged electronic parts, primarily capacitors and silicon controlled rectifiers. In its initial tests this relatively crude push-only machine achieved over 30 gravities! In 1978, with funding from NASA and the newly-formed Space Studies Institute, Dr. O’Neill began work on Mass-Driver II at Princeton University. This machine was constructed to incorporate all of the design details of a full scale lunar launcher. 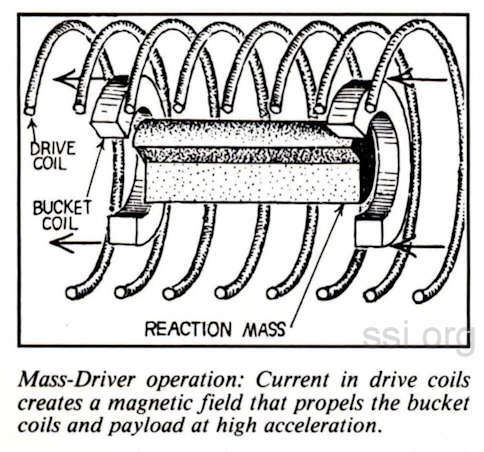 Mass ­Driver II utilized a push-pull design where each drive coil first pulled the bucket coil toward it and then repelled it as it passed. In addition, the bucket position was sensed by the interruption of light beams as it moved down the machine. The bucket itself was kept from contacting the drive coils by means of electromagnetic flight. As the bucket moved along the Mass-Driver, it was repelled by magnetic eddy currents in aluminum guide strips which ran the length of the tube. 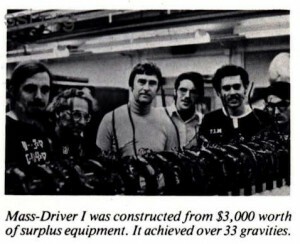 Mass-Driver II was operated at nearly 500 gravities. It demonstrated the feasibility of the push-pull design and of the control circuitry necessary to store and direct the electrical power required for its operation. Following the successful testing of Mass-Driver II, Dr. O’Neill began the development of a new design based upon an interesting phenomenon learned in the tests. It was discovered that as buckets were pulled into the drive coils, a centering force resulted that was many times stronger than that provided by magnetic flight along the aluminum strips. The new design specified a “pull­only” geometry which eliminated the need for the aluminum strips. Removing the strips made it possible to make the bucket coil nearly the same diameter as the drive coils. This in turn led to a much greater magnetic coupling efficiency. Mass-Driver III was constructed at Princeton University by Dr. Les Snively of the Space Studies Institute. 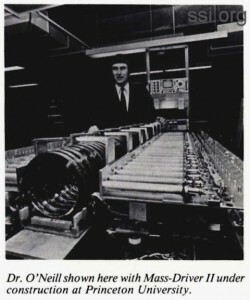 Using the design developed by Dr. O’Neill, the SSI team built this device which has drive coils each 15.5 inches or 39.37 centimeters in diameter. This is the same diameter that will be used in the lunar machine. With the successful construction, testing and demonstration of the series of Mass-Drivers described above, the basic concept of this equipment has been proven beyond a doubt. However work remains to be done in such areas as velocity control, trajectory analysis and bucket energizing. The Space Studies Institute is continuing research in these areas. One key component of SSI’s research has been an investigation of possible means of chemically separating and refining lunar soils into their constituent elements. Since the Institute was created a number of techniques have been proposed to accomplish this task. To go beyond paper studies in this area, the Institute funded a multi-year research program carried out by Rockwell International under contract to SSI. 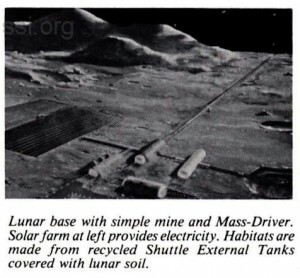 The result of the study, which examined a hydrogen fluorine acid leach process in order to obtain a wide range of output chemicals from the lunar soil, was that such a plant is feasible and would require little or no resupply of reagents from the Earth. The study concluded that it is possible to build much of the plant equipment using output from a low capacity starter plant. This would mean that most of the mass brought up from the Earth would be an initial supply of hydrogen, fluorine and nitrogen reagents. The full-up plant would eventually produce an annual output of over 500 times the mass of the original reagents imported from the Earth. 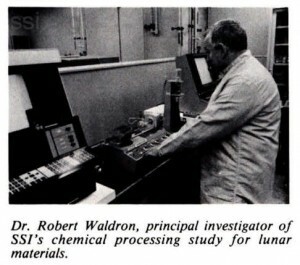 In addition to chemical processing, the Institute is examining processing technique which produce useful products from lunar soil without the use of chemical reagents or consumable electrodes. Some of these techniques can also be used to pre-process lunar soil before it is introduced into a chemical plant to increase the concentration of useful, materials. 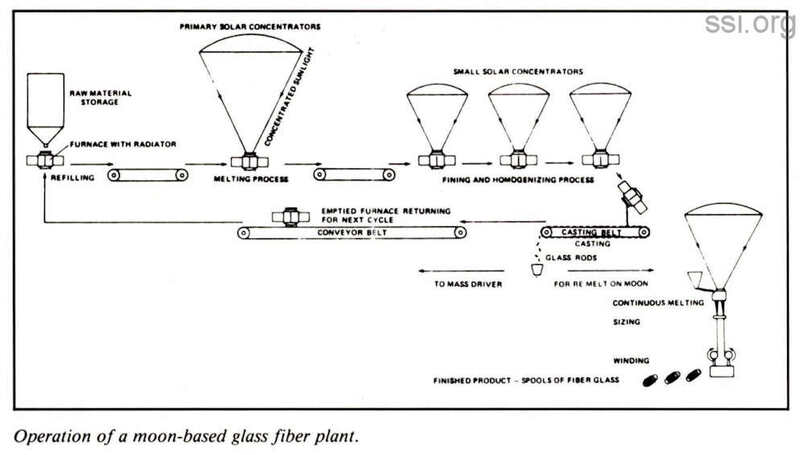 This sort of pre­processing is known as beneficiation. Lunar soil contains finely powdered nickel-iron as the result of meteoroid impacts. These materials can be removed from lunar soil by magnetic or electrostatic separation techniques which are presently in commercial use on the Earth. The powdered metal thus recovered can be used to make precise machine components by means of sintering or powder metallurgy techniques. In addition, removing the iron components from the soil improves the efficiency of some of the additional processing methods that have been proposed. 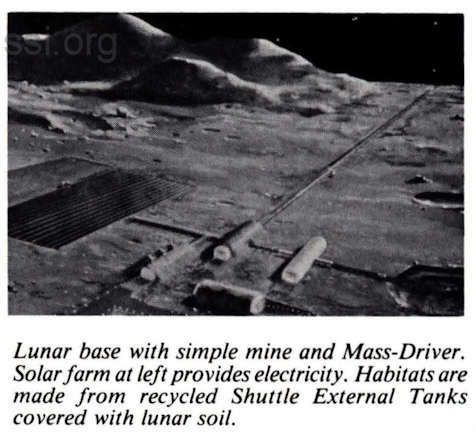 The traditional approach to space construction from lunar materials assumed that lunar soil would be processed for metals that would be used for the fabrication of structural members for space construction. However, a new method of obtaining large quantities of useful materials for space construction has recently been proposed. Lunar glasses could be made into both fibers and matrix material for the production of strong, durable composite members. In addition to better thermal properties and no undesirable electrical properties, the amount of equipment required to convert lunar soil into finished composite structures would be much less than that required to process metals from lunar materials. The Solar Power Satellite (SPS) allows tapping the inexhaustible energy resource of sunlight in space, to sustain human activities on Earth. The use of nonterrestrial resources for SPS construction could help meet the energy requirements for the growing world population in the 21st century, as the majority of the world’s population enters the industrial revolution. were found in these studies. 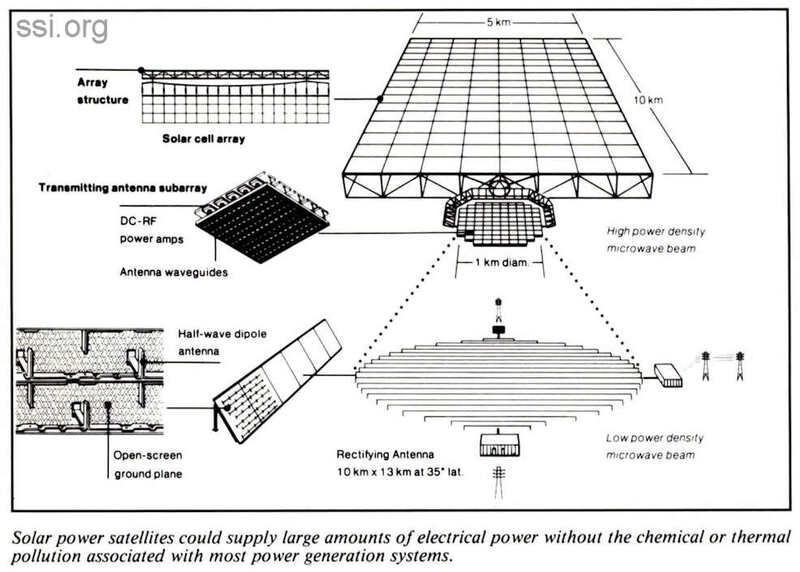 However, Governmental research on the SPS came to a halt when a National Research Council report suggested that the SPS was economically impractical due to the costs of launching all of the satellite components from the Earth and the costs of fabricating the sort of solar cells used in the study’s reference design. In an exchange of correspondence between Dr. Frank Press, President of the National Academy of Sciences (which had commissioned the NRC study) and Dr. Gerard K. O’Neill, President of the Space Studies Institute, the Academy acknowledged that its study had not, in fact, addressed the potential costs savings associated with removing SPS mass constraints by using lunar materials for its construction. Research on SPS continues in Europe, Japan and the Soviet Union. The Soviets have announced that they plan to deploy a solar power satellite by the turn of the century. 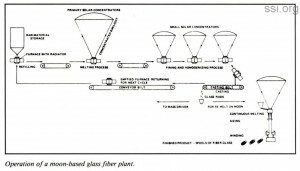 In 1984, the Space Studies Institute commissioned a study to identify the most commercially feasible way to construct a Solar Power Satellite using materials obtained from the Moon. The results of this study indicate that an SPS can be designed which uses less than one percent of the Earth-­launched material required for the Earth baseline SPS. The total mass of the system is only about eight percent greater than for an SPS made from Earth-derived sources. The study further examined alternatives to photovoltaic conversion techniques and found them promising although more massive than solid-state devices. Thus the two economic objectives to SPS development noted in the NRC report have been effectively addressed by the use of lunar materials for SPS construction. 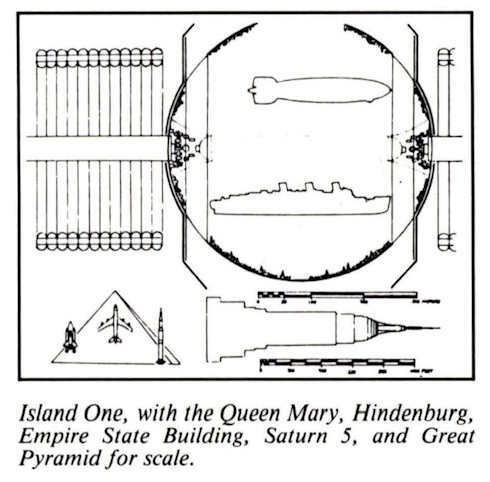 In the September, 1974 Issue of Physics Today, Dr. O’Neill published a design for a large cylindrical human habitat which could be constructed in free space from materials mined on the Moon. In summer studies conducted by NASA in 1975 and 1977, additional work on habitat design was performed. 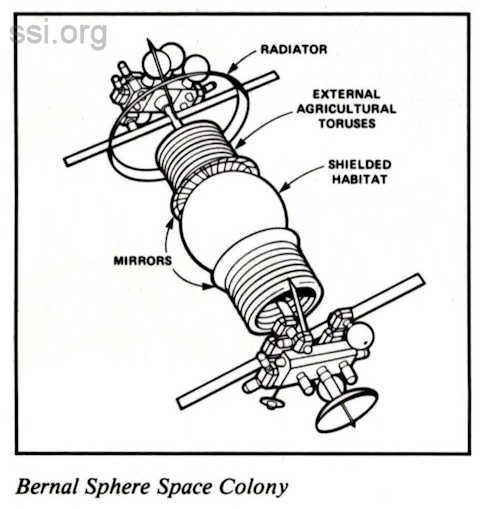 Space colony designs have included a “doughnut” or torus colony, a glass “crystal palace” configuration and many others. At present, a sphere appears to be the optimal design for a habitat for 10,000 persons. In 1985, based on design suggestions by Dr. O’Neill, the Institute began an examination to determine the smallest design capable of supplying sufficient simulated gravity for human needs. Much of the present work centers on determining the biomedical requirements of human beings in space and their tolerance to rotation rates required to provide simulated gravity. Asteroids will prove to be another important source of easy to reach material resources in space. Spectroscopic analysis of light reflected from these bodies as well as chemical analysis of meteorite samples reveals that many asteroids contain significant amounts of Water, Carbon, Nitrogen, Nickel, Iron, Platinum and other useful elements. One method of retrieval of an asteroid would be to attach a version of the Mass-Driver to the body. In this case the Mass-Driver would be used to expel unwanted fractions of the asteroid as reaction mass to propel the useful portion to the vicinity of Earth. In 1772, the French-Italian mathematician and physicist Joseph Louis Lagrange used the gravitational theory developed by Newton to explore the special properties of two unique points in the orbit of Jupiter. One of these points preceded the planet in its orbit around the Sun by sixty degrees while the other followed by the same amount. Lagrange concluded that these were in fact stable points, near which any objects with the correct initial location and velocity would stay forever. Years later, observations with early telescopes showed that several asteroids were trapped near the Lagrange points. 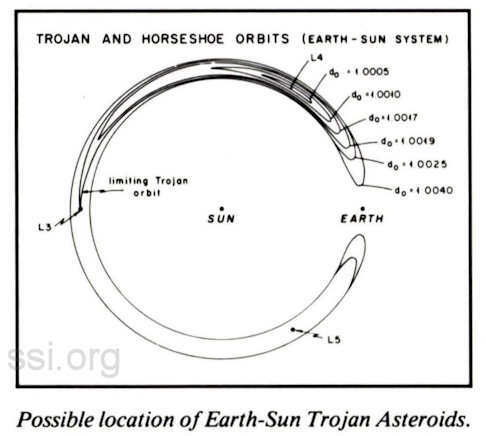 These became known as the “Trojan” asteroids. In the late 1970’s SSI Senior Advisor and Nobel Laureate in Physics, Dr. Hannes Alfven, suggested that objects might be trapped in corresponding locations along the Earth’s orbit. Under support from the Institute, R. Scott Dunbar studied the possibility of the existence of these objects and concluded that there is a good possibility of material at these locations. The amount of energy required to return materials from these locations to Earth orbit would be considerably less than for lunar launching or other asteroid retrieval scenarios. In addition, since the Trojan points are always in the same position relative to the Earth, such a mission would have no restrictive launch windows such as those characteristic of other proposed asteroid missions. However, the geometry of these locations complicates the search for objects at the Trojan points. An Earth-based search for these objects requires looking in the direction of the Sun. Because of these difficulties, to date only asteroids several tens of kilometers in size have been ruled out from portions of the Trojan regions. At present, the Institute is engaged in a study of an inexpensive probe to search for these and other easily-accessible asteroids from space. Each time the Space Shuttle is flown, the External Tank is accelerated to 98% of orbital velocity. OMS propellant is expended in order to insure that the tank lands in a vacant area of the ocean. The External Tank would be a very valuable resource in Earth orbit if it were to be saved and managed. Each tank contains metals worth $100 million if launched as a payload and another $30 million on average of residual oxygen and hydrogen. The structures of the Oxygen and Hydrogen tanks which make up the External Tank are themselves valuable as pressure vessels, habitats, structural members for space construction. SSI’s External Tank study indicates that there are relatively inexpensive techniques which can be used to extend the orbital lifetime of the tanks, save the residual propellants, and/or use the structures in space. In addition, this study looks at External Tank-based additions to the Space Transportation System such as the proposed Aft Cargo Carrier which can increase the effective diameter of the STS cargo to orbit. One key class of vehicles which will form an essential part of our space infrastructure will be reusable orbital transfer vehicles (OTV). The Institute is conducting a study to examine the long lead items required for OTV development with a particular eye toward vehicles capable of transporting people and materials from low Earth orbit to lunar orbit. A theoretical basis exists for trapped volatiles located in permanently shadowed regions of the Moon’s poles. This SSI study examines the possibility of the existence of these volatiles. The design of a relatively simple and inexpensive probe dedicated to the task of seeking these materials is presented. The cost of such a mission appears to be about equal to construction and launch of a typical communications satellite. One of the most basic needs for space development is for a reliable source of electrical power. Solar energy, abundant beyond the Earth’s atmosphere is the principal source of power for space equipment. Although most commercial spacecraft at present use photovoltaic devices to convert sunlight into electricity, this is a costly technology. While advances are anticipated in photovoltaic systems from the standpoint of efficiency, cost and ease of fabrication, the Institute is examining alternative power conversion systems. One of the most promising technologies for space power conversion is the Stirling Cycle engine. Stirling engines have demonstrated efficiencies of thirty percent in converting sunlight into electricity (roughly double that for photovoltaics). Stirling engines are easy to build and operate at temperatures which allow the use of lunar materials for their construction. As with all thermodynamic systems, these devices require relatively large radiator arrays in order to function efficiently. However, the use of non terrestrial resources will greatly reduce the mass constraints on such systems as solar power satellites so that radiator mass may not be a major consideration in comparing space power systems. At present, Stirling engines have been demonstrated which use gas bearings in order to eliminate metal to metal contact. This and other advances will reduce the maintenance cycles of such machines. 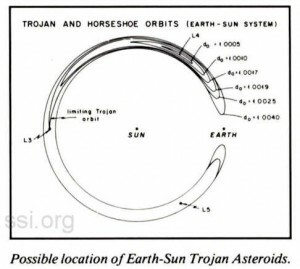 The Institute is presently investigating the requirements for a small, inexpensive probe to look for asteroids in the Earth-Sun Trojan locations. In addition the study is examining the prospects for using unanalyzed IRAS data or Earth-orbiting wide-field telescopes for the search. These techniques also lend themselves to the search for Near Earth Asteroids other than those which may exist at the Trojan points. Traditionally, spacecraft have been dependent on chemical propellants which are expelled by the energy stored within their chemical bonds. Development work also exists for vehicles propelled by reaction mass heated by solar or nuclear power. These systems are limited by either the chemical energy that can be stored subject to mass and volume constraints or by the mass of solar collectors or nuclear power plants. In order to overcome these constraints future spacecraft may receive energy from external sources. This energy will be transmitted to the spacecraft in the form of microwave or laser energy. This SSI study, now in progress, examines the options available for beamed power propulsion in the near term. Ground and space-based energy transmissions are considered. The Institute’s primary purpose is to open, for all humanity, the High Frontier of space. That goal incudes (1) using space resources of materials and energy productively, for human benefit (2) generating wealth from space resources, to improve the human condition both for those who live on the Earth, and for those who will live in space (3) building Earth-like habitats in space, to expand the ecological range of humanity initially to the space of the Earth­Moon system, later throughout the Solar System, and ultimately perhaps throughout our galaxy. The Institute’s deeper goals are the survival of humanity, the improvement of the human condition, and the expansion of human freedoms and human dignity. The Institute looks toward an open future in which the free choice of individuals, rather than the dictates of governments, will shape individual human destinies. 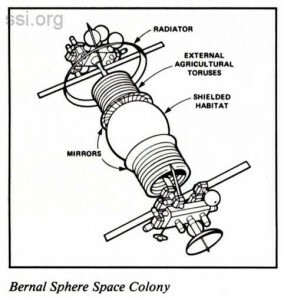 MICRO BIBLIOGRAPHY ON SPACE COLONIZATION. 2081: A Hopeful View of the Human Future is available in hardcover from the SSI office. Please enclose $15.20 in check or money order along with your name, address, and request and send to SSI, Princeton, NJ. The High Frontier is currently being published in softcover by Anchor/Doubleday and is available by order through most bookstores. Dr. Gerard K. O’Neill, “The Colonization of Space,” Physics Today, September 1974. 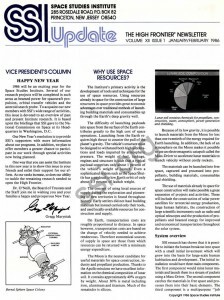 This was the first article on space colonization published by Dr. O’Neill. Dr. Issac Asimov, “The Next Frontier,” National Geographic, July 1976.
popular articles on space colonies. Dr. Gerard K. O’Neill, “The New American Frontier,” Discover, November, 1985. This article describes a practical approach to large-scale space development in the near future. To obtain a copy of the SSI compiled Space Bibliography, please send you name, address, and request to SSI. Members of the Space Studies Institute receive “SSI Update,” the Institute’s newsletter on a bi-monthly basis, notices of selected events in their area, and discounts on books and other materials. Through the support of our members we are able to fund the research needed for humankind’s breakout into the High Frontier of space. To become a Sustaining Member of SSI send your name, address, and tax-deductible donation for $15.00 or more to Space Studies Institute, 285 Rosedale Road, Princeton, NJ 08540. If your company has a matching gift program, please send along a form and we will submit it. The Senior Associates Program is currently SSI’s largest source of funds for High Frontier research and education. The program provides a way for anyone interested in the High Frontier to play a key role in making space colonization and space manufacturing achievable within our lifetimes. The Senior Associates Program was created in 1979 to generate the steady funds that SSI needs to conduct research projects, most of which require money for several years. Today we have about 900 active Senior Associates. The program provides about 60% of SSI ‘s annual budget and is essential to both our research and educational activities. Senior Associates receive special benefits as our thanks for their support. 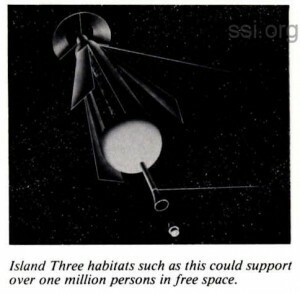 These benefits include invitations to special events, free mailings of publications by SSI, NASA, and other space organizations; and confidential letters from Dr. Gerard O’Neill, describing SSI developments before they are made public. Most people become Senior Associates because they want to see space colonization become a reality; so they give much-needed funds and join the group of people working to create the High Frontier in our lifetimes. As Senior Associates, they also meet others who share their enthusiasm for space exploration and development. Payments can be made annually, semi­annually, or quarterly. Each Senior Associate receives a number with his or her rank, indicating when he or she joined the program. Each Senior Associate also receives a certificate, signed by Dr. Gerard O’Neill, as a permanent record that he or she was one of the first people who gave critical support to the High Frontier. The names of the Senior Associates will also be permanently maintained by SSI to provide historians with the names of early High Frontier supporters.